Learning Ecologies: Can the City Be Our Classroom? Over the past few months, Gensler San Francisco’s EDU 2.0 group, a cohort of emerging designers, strategists and leaders in the Education practice area, hosted a series of three roundtable discussions around the experiential learning trend and what it means for educational institutions and cities. In recent years workforce needs have shifted to value entrepreneurial skills, with education gradually reflecting this shift. Entrepreneurship reaches far beyond the concept of creating a business. Rather, it is a mind-set that looks for opportunities and answers to critical challenges. Understanding how to prepare all students, not just budding tycoons, for the current work landscape is essential when designing for education, and transformative for its landscape too. The Garage at Northwestern, Image: Garrett Rowland. Innovative learning environments have hit the mainstream in recent years - academic incubators and their ensuing culture of entrepreneurship and innovation are emerging on campuses globally. These spaces are playing a large part in the evolution of today’s education environments and have become a powerful tool for learning, collaboration and institutional student yield. Colleges and universities are competing to keep up with this trend and meet the modern student’s needs for success. Over the past five years, we’ve seen a specific trend emerge in the world of higher education. It’s the emergence of a relatively small space, called the academic incubator. 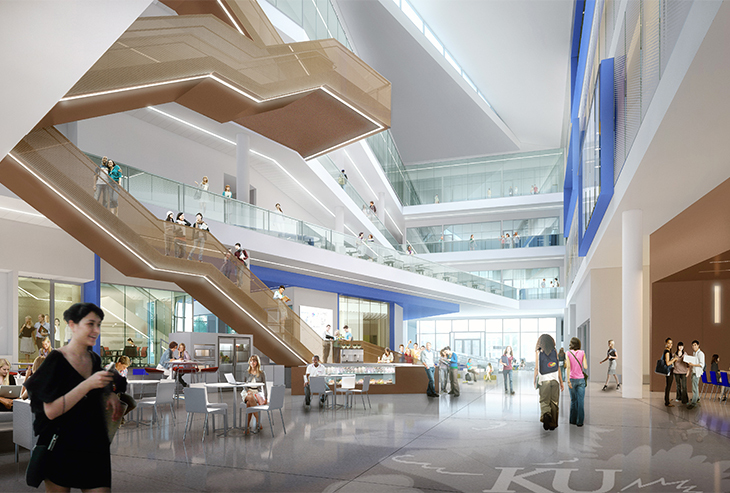 For Gensler, this began with universities such as MIT and organizations like Chicago’s 1871. They were designing hybrid maker spaces that acted as ‘bridges’ between the worlds of academia and the workplace, and they had the feel of entrepreneurial start-up offices. They may seem like a fad that’s spreading lightning-fast through the worlds of business and education, but we think they signal a more important paradigm shift. We see academic incubators as the spark igniting a revolution in design for learning. Garage at Northwestern. Image: Garrett Rowland. The student union has always been a college campus’s shared environment. It’s where students gather and a sense of community is fostered. Student unions historically offered leisure activities like bowling, movie night or student government offices, but today’s students are looking for more. They want to unite for something meaningful – not just for themselves, but for the benefit of their communities. Universities are filling this void with innovation centers and academic incubators.